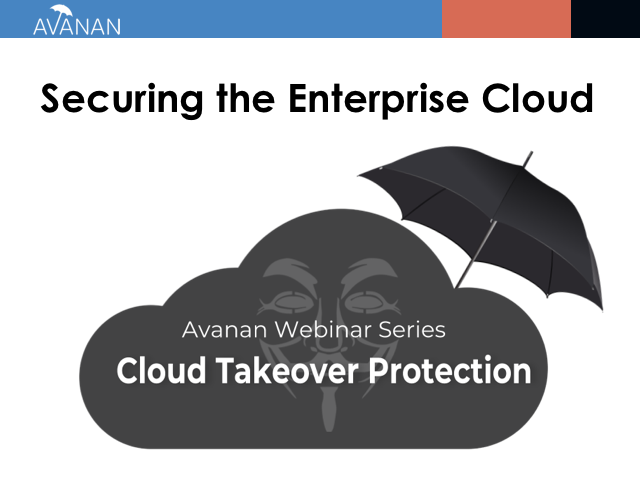 Part of Avanan's "Securing the Enterprise Cloud" Series, this webinar focuses on the Cloud Account Takeover Threat. Slack has been rapidly growing as the communication tool of choice for organizations on the cloud. Although it adds collaboration and convenience to the workplace, it also comes with a new array of threats and vulnerabilities. During this session, we'll describe how Avanan's next-generation Cloud Access Security Broker redefines the term CASB. Part of Avanan's "Securing the Enterprise Cloud" Series, this webinar focuses on IaaS: AWS, Azure and Google Compute. Part of Avanan's "Securing the Enterprise Cloud" Series, this webinar focuses on G Suite. Part of Avanan's "Securing the Enterprise Cloud" Series, this webinar focuses on Office 365. • Monitor and enforce regulatory compliance for all users. Part of Avanan's "Securing the Enterprise Cloud" Series, this webinar focuses on Citrix ShareFile. • Monitor and enforce regulatory compliance for ShareFile users. You can't predict when, but we can show you how the next attack might happen. We will discuss the security trends of 2017 that predict the most likely threats of 2018. We will cover the expanding list of attack targets and identify the necessary tools to protect against the newest attack vectors. Whether you are using Office 365 or G Suite, Slack or Salesforce, Box or Amazon S3, you need to protect your data from malware, data leakage or malicious users. All of these cloud applications can be used to infiltrate your business. All of these cloud applications are potential targets of an attack. While no one can predict tomorrow's attack, we can analyze the trends and build a multi-layer, defense-in-depth solution that can respond to the changing threat landscape. Office 365 is more than just apps. It’s email, file sharing and collaboration. Threats are more than just malware. Phishing, ransomware, data leakage, accidental shares, insider threats, compromised accounts, compliance failures and regulatory violations are just few. How do you secure your cloud? Once, your options were limited. In this webinar we will discuss the transformative change that has made it possible to secure Office 365 with the same level of protection you would deploy in your own datacenter. Brought to you by Redmond Magazine. Microsoft's new Secure Score is a great way to identify gaps. Phishing is a threat that extends beyond email. Advanced Threat Protection has some important limitations. Security orchestration across Office 365 is as great a challenge as policy management across multiple SaaS. Attendees will have an opportunity to check their own Office 365 environment for potential threats. The Avanan Cloud Security Platform is the next-generation cloud security platform that offers the industry's top-rated solutions for malware, phishing, data leakage, encryption, anomaly detection, shadow SaaS and more. In this webinar, we will discuss why phishing has become the most pervasive threat to cloud security, spreading from cloud-based email like Office 365 and Gmail to other communication products like Slack and Skype. We will will see why most phishing attacks are now specifically targeting SaaS customers and how SaaS-targeted attacks are both more dangerous and harder to detect. If you are considering a CASB or email MTA gateway, you should see this video first. Securing Office 365, GSuite, Amazon and every other SaaS and IaaS has never been easier. Protect your data from malware, data leakage and malicious users. In this webinar, we will describe the next generation Security-as-a-Service platform that makes it easy to protect your data with the industry's highest rated technology for anti-phishing, sandboxing, antivirus, file sanitization, data leak prevention, compliance and more. Avanan, The Cloud Security Platform, protects data in any SaaS. Partnering with the industry's most trusted security vendors, Avanan offers cloud-native versions of the most advanced technology to protect against malware, phishing, ransomware, data leakage, insider threats and more. The cloud-based platform is completely out-of-band and can be deployed in one click. The Avanan disruption in the marketplace is actually an elimination of the chaos of incompatible products that do not work together or don't integrate with the current enterprise security architecture. • The User: who needs to just get work done. Soon, the Avanan Platform is the way that all cloud security technology will be compared, purchased, deployed and managed. Microsoft is struggling to stop phishing and ransomware in Office 365. Now there is a solution. Over 70 of the leading security vendors have joined together in one platform to create the most complete, cloud-native protection for SaaS-based email. Best of all, it works in parallel with Microsoft and Gmail to deploy as simply as an app-store one-click application. It is not necessary to have Check Point products installed on the network. Attendees will be given an opportunity to test the solution on their own SaaS. Government-developed malware is loose and IT teams are scrambling. No Avanan customers were affected and we had the resources of multiple partners to analyze the attack. In this webinar we will analyze the details of the WannaCry code and look ahead at what to expect in future NSA-inspired outbreaks. The proliferation of state-sponsored code to unknown attackers makes is all the more necessary to improve the arsenal of tools we use to defend against them. We will introduce the zero-day monitoring tool at www.avanan.com/gauge and show how different tools on the Avanan platform respond to an outbreak. Today, more than ever, the only protection is a multi-layer, multi-technology, multi-vendor solution. True defense-in-depth that includes the best technology that the security industry can offer. What we know and have trained users about phishing attacks has changed. Old methods no longer apply. IT teams have deployed filters and taught our users to detect phishing attacks by scanning for suspicious URLs, spoofed login pages, and unrecognized senders. We've told people to change passwords, turn on two factor authentication and watch for suspicious logins. None of these methods can defend against the next generation of automated, malicious API-based phishing attacks that are invisible to users and unmonitored by SaaS. Once exclusive to advanced state-sponsored actors, the recent Google Docs worm pushed this sophisticated method into the headlines. In this webinar we will dig deep into the next generation of phishing attack and describe the new methods every IT team must deploy to defend against them. Because the vulnerability is not unique to Google, we will also discuss Office 365, Box, Salesforce and other popular business apps. Every day, we test popular SaaS like Office365 and GSuite against the latest zero-day threats. • Which SaaS offer the best built-in protection? • Is it worth paying more for Microsoft's Advanced Threat Protection? • Is there a difference in protection between email and file sharing? • Should I scan both inbound and outbound? What about internal email and sharing? • How do I add more security if I need it? Avanan's Cloud Security Platform is uniquely positioned to understand the security profile of most every cloud provider. Integrated with all major SaaS and partnering with over 70 security vendors, Avanan constantly monitors for the latests security threats and measures the risk profile of each cloud provider. We will discuss recent attacks and the speed of each cloud vendor's response. We will compare each SaaS window of vulnerability and adaptation to the changing threat vectors. Email security used to mean a gateway. With Office365 and Gmail, this is clumsy. What's the alternative? Just moving a gateway appliance to the cloud does not make it cloud-native. • What is the difference between 'cloud-based' and 'cloud-native' security? • What are the drawbacks of MTA-gateway security for email? • How do you protect the full Office 365 and GSuite applications beyond email? File sharing, apps and collaboration need protection too! This webinar discusses the next generation of API-based 'cloud-native' security tools that offer complete SaaS security. • Protects from all types of threats—malware, phishing, data leakage, encryption and lost credentials. Expert teams from Avanan and LIFARS will discuss what you must do to secure your cloud infrastructure. You might think your organization's cloud security posture is strong, but are there gaps you just don't know about? And if there were, how you would identify and remediate them? As companies continue to move to the cloud, it's becoming ever more important to have a multi-layered cybersecurity program in place. This webinar will address some of the most important trends in SaaS security, what it takes to be successful, and what you must do now to secure your cloud infrastructure and applications. · The challenges in protecting users and data in the cloud. · How the cloud makes it difficult to identify and remediate security events. · What it takes to implement a successful SaaS security program. · How a multi-vendor, defense-in-depth approach can further secure their operations. · Why having an incident response plan for cloud security incidents is so important. · A new cloud security assessment solution to combat the SaaS security issues within their organization. We live in a society where we have to place warnings on cups that the coffee you’ve just knowingly purchased is hot, yet we hand out smartphones to kids like they’re candy without understanding the risks that these devices pose to our safety. We’ve become so dependent on digital technology that we don’t stop to consider the consequence of our choices. A Black Hat survey showed that 28% of people felt that the weakest link in enterprise IT defenses was "end users who violate security policy and are too easily fooled by social engineering attacks.” Whether laziness, optimism or naiveté, it’s in our nature to trust - even when it puts us, our company or society in danger. Trust is inherently a human character - we yearn to belong and trust. This panel explores the role of trust in cyber security, in defense and in our everyday lives. Can human be taught to make good decisions with security consequences given our desire to trust? Can we conceptualize trust into machine processable information so that machines can make better decisions on behalf of humans? Can we develop security and defense solutions that work on partial and uncertain information but still protect us in the face of uncertainty? We will also explore how the concept of identity plays into trust. Do certain aspects of identities deliver more trust than others? And can we associate assurance level with fine-grained aspects of identity data so that we can more dependable trust decisions? All these and more will be explored by our panelists, including a security researcher, an identity expert, a neuro-behavior expert, and a solution provider. Avanan offers best-of-breed security from the industry's most trusted vendors to protect enterprise data in the cloud.